Over the past week, Syrian government forces or their Russian allies have launched at least five aerial attacks on three of the main hospitals in Syria’s Idlib governorate, the most concentrated string of hospital attacks Physicians for Human Rights (PHR) has verified in Syria since April. The three facilities came under fire on the same day, September 19, and two of those hospitals came under separate attack just days later. PHR said today all five attacks likely constituted war crimes, either because they were targeted attacks on operating medical facilities or indiscriminate strikes in violation of international law. Of the five attacks PHR has verified in the past week in Idlib governorate, three took place on the same day. On September 19, airstrikes pounded Kafr Nabl Surgical Hospital in Kafr Nabl, destroying an ambulance and damaging the facility’s emergency ward; al Rahman Children and Maternity Hospital in al Tah, where one hospital staffer was killed; and al Rahma hospital in Khan Sheikhoun, a facility built into a cave that was attacked in April following a chemical weapons strike in the same town. ”I was there at the hospital,” Hazem, a nurse at the al Rahma facility who asked we not use his last name, told PHR researchers. “We were very busy as we were treating the injured from strikes on the city, and there were two patients in the operating room. We continued working despite the airstrike, we did not leave until we had finished our work.” Three days later, in the early hours of September 22, the hospital again came under bombardment, causing structural damage and forcing the facility to close. The staff narrowly escaped with their lives. 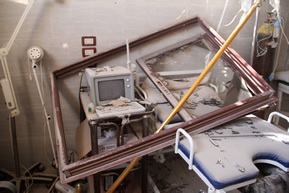 Imagery of Kafr Nabl Surgical Hospital reviewed and verified by PHR, as well as testimony from eyewitnesses, confirmed extensive damage from the September 19 strike, which forced the hospital to temporarily suspend services. Early on the morning of September 26, that same facility was struck again by multiple airstrikes. One of the missiles directly hit the hospital, breaking through three floors and forcing the hospital to halt services indefinitely. PHR has documented 478 attacks on 323 separate medical facilities in Syria since the conflict began in 2011, as well as the killing of 830 medical personnel.